The world’s only surviving tea clipper ship, Cutty Sark can be found on the banks of the River Thames in southeast London, as part of the UNESCO World Heritage Site of Maritime Greenwich. The ship’s name is taken from a Robert Burns poem, Tam O’Shanter, which was written in 1790 and depicts a man being chased by a witch wearing nothing but a ‘cutty sark’ – or for those unfamiliar with archaic Scottish vernacular, a short nightshirt. 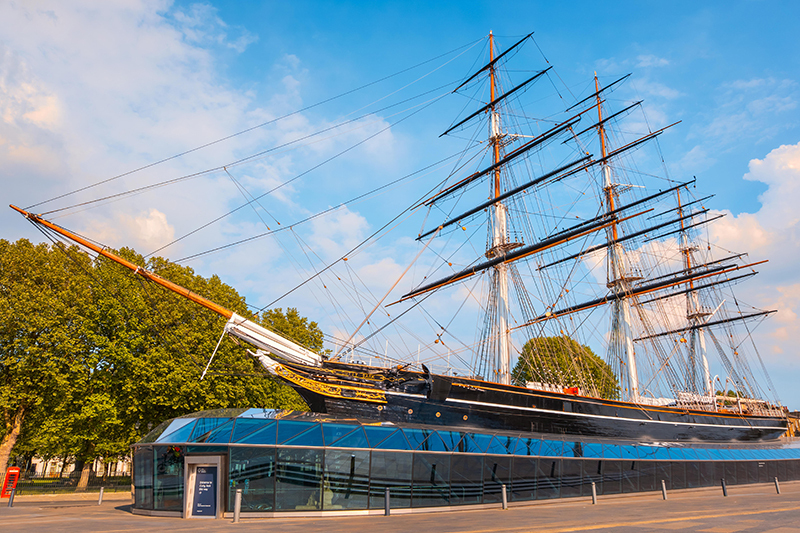 Built in 1869 on the River Clyde in Scotland, Cutty Sark was a masterpiece of ship design. She was beautiful, fast, sleek and strong and was responsible for bringing tea all the way from China and into the delicate cups of Victorian gentry. Tea clippers needed to be quick – the first batch of fresh tea to make it back to England would fetch the highest price. While Cutty Sark never won the ‘tea race’, she was always exceptionally fast. Nevertheless, steamships soon rendered Cutty Sark almost redundant. She was taken to Japan on a coal delivery but half way there a deadly mutiny broke out that resulted in the captain’s suicide. Cutty Sark’s reputation plummeted with sailors from far and wide referring to her as a “hellship”. However, she managed a few more years of work in Australia and, by the late 1930s, she was used as a training ship for the Merchant Navy in London before sliding further towards a certain death on the scrapheap. In 1951, however, she was saved by the Cutty Sark Society, a registered charity that admired her keenly. Today she stands tall and proud, in service once again as a magnificent piece of history. Visitors can learn how to steer the ship, meet family- friendly characters from the ship’s past, and enjoy afternoon tea underneath the ship’s copper-plated hull.